As a member of the Sports Centres network, we have the necessary facilities to ensure proper recovery from sports injuries and return to optimal playing form. We use chiropractic treatment, electro-therapy, laser, soft tissue release and rehabilitation exercises to get athletes back in the game with minimal time off. Bridgepoint Chiropractic is the Niagara Region branch of the Sports Centres clinic network. Sports Centres clinics can be found across Ontario, treating all types of athletes, from weekend warriors to high-level competitive athletes. Most notably, the Sports Centres are exclusive health care providers to the Ontario Soccer Association, treating players from regional, provincial and national teams. 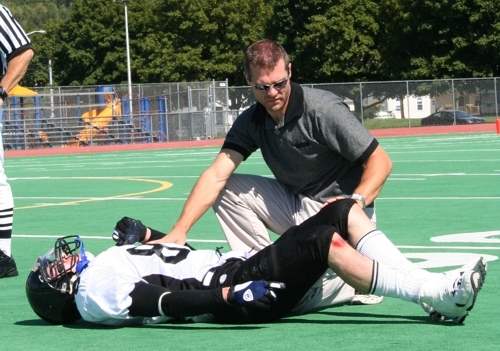 Dr. Garner is currently responsible for emergency care, treatment and rehabilitation of athletes involved with the OSA youth soccer programs, OSA sanctioned tournaments, coaching clinics and player development camps. Along with the Ontario Soccer Association, Dr. Garner has also been involved with the Niagara X-MEN, providing on-field injury assessment, treatment and rehabilitation while also serving as Wide Receiver and Defensive Back coach. Dr. Garner's own experience with sports injuries inspired him to seek a career that gave him the opportunity to educate young athletes on injury prevention, proper treatment and rehabilitation. Playing several sports throughout his youth, Dr. Garner realized there was little information available to young athletes on injury rehabilitation and prevention. Throughout his athletic career, Dr. Garner played baseball, basketball, volleyball and track & field, but his passion was football. He played 5 years for Port Colborne High School, earning 2 MVPs and team captain status. He then played two seasons with the Niagara Colts football organization, the predecessor to the Niagara X-MEN. Dr. Garner also played defensive back for the McMaster Marauders football team while attending McMaster University. Presently, he remains active with coaching and recreational sports.